This is my mother-in-law's Chicken Burger Patty recipe. I find it very healthy as it uses chicken breast and a lot of onion. She often makes it for us for dinner to have with rice. I thought it would be just as nice in burger bun. I used the Potato Bread rcipe for the burger bun. Your kids will love this simple and healthy homemade alternative to junk food. Chop the chicken into a fine mince. Divide into 3 portions and roll each portion into a ball. 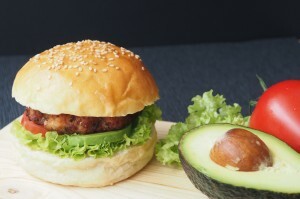 Using the palm of your hand, press and shape into the burger patti, around 4cm diameter. Placing the patty on a piece of baking paper makes them easier to manage. Preheated a pan with cooking oil over medium-high heat. Place the burger patties in and pan fry them on each side for about two to three minutes till the sides are browned. Place burger patties on a toasted bun, topped with your favourite condiments, serve, and enjoy. Put all ingredients (first add salt, flour, sugar, yeast, butter, egg, mashed potato and lastly fresh milk) in a bowl of stand mixer and knead till the dough come together, until achieve window pane stage (the dough at this stage should be able to be pulled and stretched into membrane). It takes around 10 to 15 minutes at medium speed. If the dough is wet, add 1 tablespoon of flour at a time until you get the consistency you want. Set it aside to rise for 1 hour or till double in size. Divide dough into 10 equal portions on a floured surface and shape into balls. Place dough in 2 flat pans lined with non-stick baking sheet. Make sure they are about 1 ½ to 2 inches apart. Let the dough rise for another 45-60 mins or until double in size. 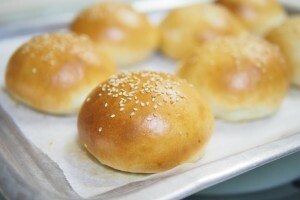 Brush the dough with egg wash and sprinkle with some sesame seeds on top. Bake at pre-heated oven at 180C (160C fan mode) for 15 to 20 minutes. Remove buns to cool on rack completely. Add 120g of fresh milk first, then slowly add in the rest if dough is too dry. If fresh milk is not available, you may use 120g - 150g water + 2 tablespoons of full cream milk powder.